I remember 1956 because I was young and growing and usually hungry. We were dirt poor. My dad the machinist/poet/dreamer had piled us into his old black sedan the year before and moved us from the city to 16 acres of half-tilled stone-choked Niagara land in the middle of nowhere. My youngest brother – a chubby, happy guy – had been born in February. In April, the creek winding through our fruit farm overflowed, drowning grape vines and part of the apple orchard. He’d drive into town every morning to a job that paid him money. The farm gobbled it up like an animal. She’d flip up the kitchen curtain to check on my two other brothers, then she’d turn off the stove, wipe her fingers on her flowered apron and climb slowly up the stairs to the attic, her shoes squeaking on the rubber risers. The narrow stairway smelled of soup. She’d stop about four steps from the top and stand for a minute, head bowed as if she was praying. Her breath was loud in the small space. Beside her right arm was a door sunk into the dark wood paneling. In the middle of the door was a small brass handle with pointy edges on one edge like a small bird’s beak. She’d turn the handle, then fold the door back so it wouldn’t bang. Fragments of light glittered from random gaps between the crooked roof shingles. I’d press tight against her side to watch her reach her arm in. It was as if her fingers had eyes to see the dusty cord that dangled from the light fixture nailed to the rafters. Pulling the cord made a clicking sound. The lemony light cast her smooth brown features into sharp shadows. Our breath fluttered the cobwebs like pale sails. Dust swirled around the bare bulb, disappearing deep into the shadowy attic. I remember shivering, wondering if we were disturbing someone who hid there and who might come out when the door wasn’t shut tight. One hip pressed against the wall, she’d tug out a square leather box with silver fittings glittering at the corners. It had one of those swing-down catches with a little crooked tooth that snugged into a metal loop on the front. We’d sit on the stairs, knees touching. Mom’s eyes glittered like damp stones. Her palm was warm on my shoulder. She’d gesture, ‘go ahead’ with her chin. I’d scrub my hands on the hem of my brick-patterned dress then brush time’s dust off the top with inside of the hem. Mom would whisper, wiping her eyes with the corner of her apron, “My mother was a dainty woman.” She’d usually turn away to look up at something I couldn’t see. I’d ask sometimes, “Are you crying, Mama?” She never answered. I slipped my hand inside the shadows of the box. Flimsy tissue stirred up a confusion of scent – lavender, rose and leather. I lifted out the treasures, knowing they held her memories. An ivory plastic Blessed Virgin Mary cradling baby Jesus. Brittle greeting cards with stained edges. Creased blue airmail letters cramped with my Dad’s writing, over-stamped with ‘Allied Forces Overseas’. A carved wooden Sphinx he’d bought in Egypt. A baby shoe – mine – worn down at the heels. 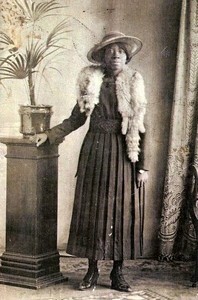 A photograph of a woman was tucked against a corner. My mother held it like it was holy. Sometimes the picture danced between her trembling fingers. The camera had caught my grandmother’s dark oval face, her unblinking gaze under a solemn brow. Grandmother’s thick wavy hair was pinned up under a fancy hat. A fur thing drooped around her neck, over a sombre pleated dress. Her fingers gripped a decorative plinth as if to press it to the floor. The date in the pinked margin read February 1938. Less than 12 months later, she would sit in a dentist’s chair for a wisdom tooth extraction and not awaken from the ether. My mother, at 19, was left the guardian of three siblings. She wore the weight of that death all of her life. I peeled back the layers of paper and uncovered my grandmother’s shoes. They were tiny – size 4 – black, with a sweep of leather buttons from arch to ankle. They were creased but hardly worn. The heels were the width of three of my fingers, about two inches high. I traced the seams and fancy threading along the slender tongues beneath the cobbler’s stitched signature on the instep. I’d rub them against my cheeks, comforted by the warm, smooth scent. There was no question of me putting them on – at age ten I was almost as tall as my mother and already my feet were bigger than hers. Once, Mom picked up a packet of letters and fanned through them like leaves, only covered with writing. I remember asking her what they were. She’d said, “Your father wrote such beautiful poetry to me when we were younger,” with a sad profundity even I could comprehend. And I would look from her beautiful chapped hands that were almost never still, to the mute epistles in her lap. My eyes would feel hot and full and my ears would throb. We would rest on the steps until my brothers banged through the screen door or the milkman crunched his buggy down the gravel driveway. Then she would motion for me to put everything away. She’d push the box back into the shadows, snap off the light and close the door with a sigh. I would sigh too, my skinny shoulders rising and falling in time with hers. Leaning against the wall, she would fold me to her chest, the smell of her body filling my nose, displacing the scents of our pasts. Back then I thought it odd that she never wanted to hold Grandmother’s ‘good’ shoes. But when my mother died just as unexpectedly sixteen short years ago, I began to understand the power of possessions so personal. Even today, when I venture to the storeroom to go through her things that I’ve stored since her passing, they hold a resonance that brings back that pulsing throb, the thickness in my throat, the tremor of longing in my fingers. Oh, Mom. So I tuck them back into their boxes and retape the lids. Perhaps next year I’ll try again.